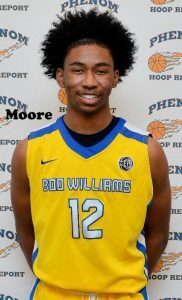 Christian A. Moore (Va.), 15, plays on the Nike EYBL circuit with Boo Williams. At Cape Henry Collegiate High School Moore has a 3.85 grade point average. Chieftain Moore uses his speed and dribble to break the full court press while surveying for open teammates running the floor. Christian can score comfortably from mid range and beyond the NBA three point line. This gritty on-ball defender is skilled at stripping ball handlers at half-court and jumping in the passing lane for well-anticipated steals.